One option you have for printing multiple photos from Photoshop Elements 11 is picture packages. This feature prints multiple copies of the same photo or multiple copies of many photos. A picture package is typically a single sheet of paper with the same photo printed at different sizes — something like your class pictures, graduation photos, or prom photos. You can choose to print a single picture package from one photo selected in the Organizer, or you can select multiple photos and print them all as multiple picture packages. Select a single photo or multiple photos in the Organizer that you want to print as a picture package(s). The Prints dialog box opens. From the Select Printer drop-down menu, select the printer you want to use for your output. Select Picture Package from the Select Type of Print drop-down menu. The Prints dialog box refreshes to show your picture package options. Select a layout from the Select a Layout drop-down menu. As you make layout selections, you see a dynamic preview of the picture package. Select different layouts to examine the results and choose the layout you want for your picture package. The photos can be printed with a frame. Select an option from the Select a Frame drop-down menu or leave the default None selected to print no frame on the photos. Choose a color profile from the same dialog box that appears when you print a contact sheet. In the Print Photos dialog box, click the Print button. Click Editor to open the selected photos in the Photo Editor. Make choices for the layout, page size, and captions and click OK. 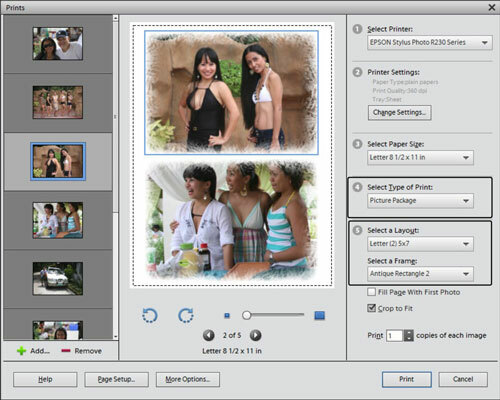 The Picture Package is automatically assembled and opens in the Photo Editor.